In this section, we’ll look more closely at the patterns of communication in business—who sends the messages, who receives them, and the different types of messages businesses typically use. In communications, a channel is the means of passing information from a sender to a recipient. Determining the most appropriate channel, or medium, is critical to the effectiveness of communication. Channels include oral means such as telephone calls and presentations, and written modes such as reports, memos, and email. 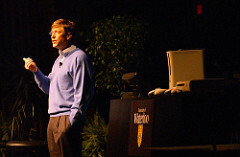 Bill Gates speaking at a school. A speaker giving a large presentation is an example of oral communication. Oral communications tend to be richer channels because information can be conveyed through speech as well as nonverbally through tone of voice and body language. Oral forms of communication can range from a casual conversation with a colleague to a formal presentation in front of many employees. Richer channels are well suited to complex (or potentially unsettling) information, since they can provide opportunities to clarify meaning, reiterate information, and display emotions. While written communication does not have the advantage of immediacy and interaction, it can be the most effective means of conveying large amounts of information. Written communication is an effective channel when context, supporting data, and detailed explanations are necessary to inform or persuade others. One drawback to written communications is that they can be misunderstood or misinterpreted by an audience that doesn’t have subsequent opportunities to ask clarifying questions or otherwise respond. Emails provide instantaneous written communication; effective for formal notices and updates, as well as informal exchanges. Letters are a more formal method of written communication usually reserved for important messages such as proposals, inquiries, agreements, and recommendations. Presentations are usually oral and usually include an audiovisual component, like copies of reports, or material prepared in Microsoft PowerPoint or Adobe Flash. Telephone meetings/conference calls allow for long-distance interaction. Message boards and Forums allow people to instantly post information to a centralized location. Face-to-face meetings are personal, interactive exchanges that provide the richest communication and are still the preferred method of communication in business. the cost of the communication. If you choose the wrong channel—that is, if the channel is not effective for the type of message and meaning you want to create—you are likely to generate misunderstanding and possibly end up making matters worse. Using the wrong channels can impede communication and can even create mistrust. For example, a manager wants to compliment an employee for his work on a recent project. She can use different approaches and channels to do this. She could send the an employee a text: “Hey, nice work on the project!” Or she could send him an email containing the same message. She could also stop by his desk and personally compliment him. She could also praise him in front of the whole department during a meeting. In each case the message is the same, but the different channels alter the way the message is perceived. If the employee spent months working on the project, getting a “Hey, nice work on the project!” text message or email might seem like thin praise—insulting even. If the employee is shy, being singled out for praise during a departmental meeting might be embarrassing. A face-to-face compliment during a private meeting might be received better. As you can see, getting the channel right is just as important as sending the right message. Communication within a business can involve different types of employees and different functional parts of an organization. These patterns of communication are called flows, and they are commonly classified according to the direction of interaction: downward, upward, horizontal, diagonal, external. As you learn about each of these, we will discuss how these flows function at Little Joe’s Auto. When leaders and managers share information with lower-level employees, it’s called downward, or top-down communication. In other words, communication from superiors to subordinates in a chain of command is a downward communication. 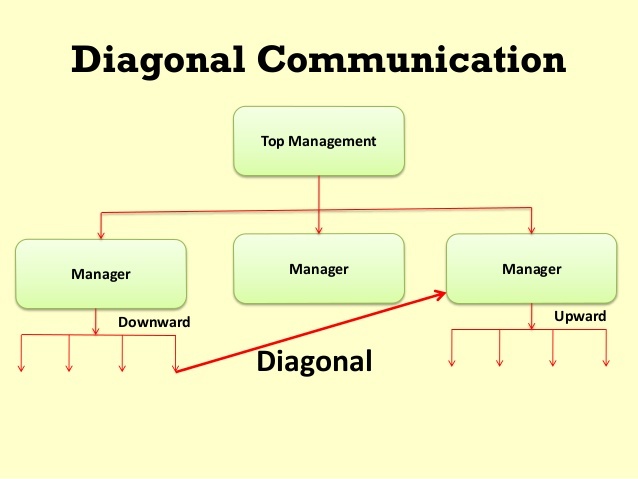 This communication flow is used by the managers to transmit work-related information to the employees at lower levels. Ensuring effective downward communication isn’t always easy. Differences in experience, knowledge, levels of authority, and status make it possible that the sender and recipient do not share the same assumptions or understanding of context, which can result in messages being misunderstood or misinterpreted. Creating clearly worded, unambiguous communications and maintaining a respectful tone can facilitate effective downward communication. Little Joe holds a meeting every morning with his entire sales staff. In this meeting he gives them information on new cars on the lot, current interest rates available to customers, and how close they are to meeting the company’s monthly sales goals. The most important information shared is a “hot sheet” that lists the cars that need to be sold ASAP because they have been on the lot for more than forty-five days. Every car sold from the hot sheet earns the salesperson a $500 bonus, adding more than a little motivation to the mix. As Little Joe goes through his morning briefing, the sales staff listen, take notes, and sometimes ask a few clarifying questions, but clearly the purpose of this daily pow-wow is for Little Joe to convey the information his staff need to perform their jobs and meet the expectations of management. Upward communication is the transmission of information from lower levels of an organization to higher ones; the most common situation is employees communicating with managers. Managers who encourage upward communication foster cooperation, gain support, and reduce frustration among their employees. The content of such communication can include requests, estimations, proposals, complaints, appeals, reports, and any other information directed from subordinates to superiors. Upward communication is often made in response to downward communication; for instance, when employees answer a question from their manager. In this respect, upward communication is a good measure of whether a company’s downward communication is effective. The availability of communication channels affects employees’ overall satisfaction with upward communication. For example, an open-door policy sends the signal to employees that the manager welcomes impromptu conversations and other communication. This is likely to make employees feel satisfied with their level of access to channels of upward communication and less apprehensive about communicating with their superiors. For management, upward communication is an important source of information that can inform business decisions. It helps to alert management of new developments, levels of performance, and other issues that may require their attention. One afternoon, Frances knocks at Little Joe’s office door, which is always open. Frances wants Little Joe to know that he has a couple interested in one of the new cars on the hot sheet, a 2015 Sonata, but the car is out of their price range by just a hair. Frances knows the couple from his church and really wants to help them get reliable transportation, but he also knows he needs to get the deal past the finance manager. Frances wants to know if it’s possible for him to cut the price to his customers and give up his $500 bonus for selling the car. Little Joe agrees, since it really makes no difference who gets the $500—Frances or the customer. Horizontal communication, also called lateral communication, involves the flow of messages between individuals and groups on the same level of an organization, as opposed to up or down. Sharing information, solving problems, and collaborating horizontally is often more timely, direct, and efficient than up or down communication, since it occurs directly between people working in the same environment. Communication within a team is an example of horizontal communication; members coordinate tasks, work together, and resolve conflicts. 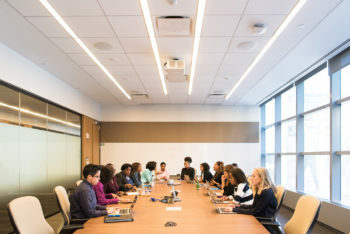 Horizontal communication occurs formally in meetings, presentations, and formal electronic communication, and informally in other, more casual exchanges within the office. When there are differences in style, personality, or roles among coworkers, horizontal communication may not run smoothly. According to Professor Michael Papa, horizontal communication problems can occur because of territoriality, rivalry, specialization, and simple lack of motivation. Territoriality occurs when members of an organization regard other people’s involvement in their area as inappropriate or unwelcome. Rivalry between individuals or teams can make people reluctant to cooperate and share information. Specialization is a problem that occurs when there is a lack of uniform knowledge or vocabulary within or between departments. Finally, horizontal communication often fails simply because organization members are unwilling to expend the additional effort needed to reach out beyond their immediate team. Little Joe picks up his phone and calls Brian, the finance manager. He explains that Frances is going to send a deal through on a hot-sheet car that is $500 less than the bottom line, but if the rest of the deal is solid, Brian should approve it. Brian immediately begins to object, when Little Joe cuts him off and says that Frances is waiving his hot-sheet bonus. When Little Joe hangs up with Brian, he tells Frances he’s set—now go sell that car! Diagonal communication is the sharing of information among different structural levels within a business. This kind of communication flow is increasingly the norm in organizations (in the same way that cross-functional teams are becoming more common), since it can maximize the efficiency of information exchange. The shortest distance between two points is a straight line. Diagonal communication routes are the straight lines that speed communications directly to their recipients, at the moment communication is necessary. Communications that zigzag along horizontal and vertical routes, on the other hand, are vulnerable to the schedules and availability of the individuals who reside at each level. Another type of communication flow is external, when an organization communicates with people or organizations outside the business. Recipients of external communication include customers, lawmakers, suppliers, and other community stakeholders. External communication is often handled by marketing and sales. Annual reports, press releases, product promotions, financial reports are all examples of external communication. The last thing Frances does before he hands the keys to his customers is to affix a Little Joe’s Auto license plate frame to the front and back of the Sonata. Now everyone who sees his customers driving their new car will know where they bought it. He hopes this sale will generate more business for himself and the dealership, so along with the keys to the car, he gives them several business cards and a coupon for a free oil change. At 2:30, Frances waves good-bye to his customers as they drive their new Sonata off the lot. 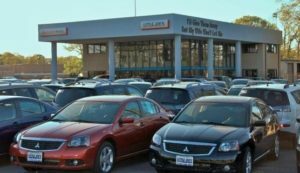 In order to close this deal, the communication at Little Joe’s Auto has flowed in every direction—upward, downward, horizontally, diagonally, and externally. By now you know that business communication can take different forms and flow between different kinds of senders and receivers. Another way to classify communication is by network. An organization’s formal communication network is comprised of all the communication that runs along its official lines of authority. 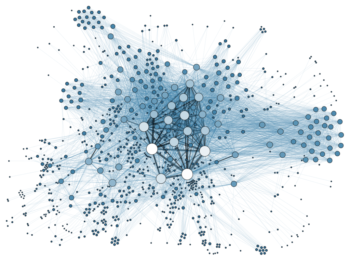 In other words, the formal network follows reporting relationships. As you might expect, when a manager sends an email to her sales team describing the new commission structure for the next set of sales targets, that email (an example of downward communication) is being sent along the company’s formal network that connects managers to their subordinates. An informal communication network, on the other hand, doesn’t follow authority lines and is established around the social affiliation of members of an organization. Such networks are also described as “grapevine communication.” They may come into being through the rumor mill, social networking, graffiti, spoof newsletters, and spontaneous water-cooler conversations. Formal communication follows practices shaped by hierarchy, technology systems, and official policy. Formal communication usually involves documentation, while informal communication usually leaves no recorded trace for others to find or share. Formal communications in traditional organizations are frequently “one-way”: They are initiated by management and received by employees. Formal Communication content is perceived as authoritative because it originates from the highest levels of the company. Informal communication occurs in any direction and takes place between individuals of different status and roles. Informal communication frequently crosses boundaries within an organization and is commonly separate from work flows. That is, it often occurs between people who do not work together directly but share an affiliation or a common interest in the organization’s activities and/or a motivation to perform their jobs well. Informal communication occurs outside an organization’s established channels for conveying messages and transmitting information. In the past, many organizations considered informal communication (generally associated with interpersonal, horizontal communication) a hindrance to effective organizational performance and tried to stamp it out. This is no longer the case. The maintenance of personal networks and social relationships through information communication is understood to be a key factor in how people get work done. It might surprise you to know that 75 percent of all organizations’ practices, policies, and procedures are shared through grapevine communication. 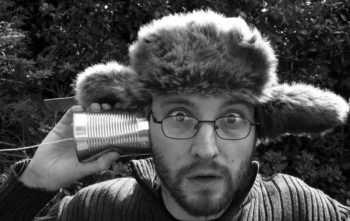 While informal communication is important to an organization, it also may have disadvantages. When it takes the form of a “rumor mill” spreading misinformation, informal communication is harmful and difficult to shut down because its sources cannot be identified by management. Casual conversations are often spontaneous, and participants may make incorrect statements or promulgate inaccurate information. Less accountability is expected from informal communications, which can cause people to be indiscreet, careless in their choice of words, or disclose sensitive information.